Athlete-Mom Interview: Susie Mitchell | Move fast. Think slow. Let me introduce you to Susie Mitchell who I met through the magic of this thing called the World Wide Web :). Susie hails from Dublin, Ireland, where she works as a Fish Vet and lives with her husband, Cormac and their 11-month old daughter, Tori. 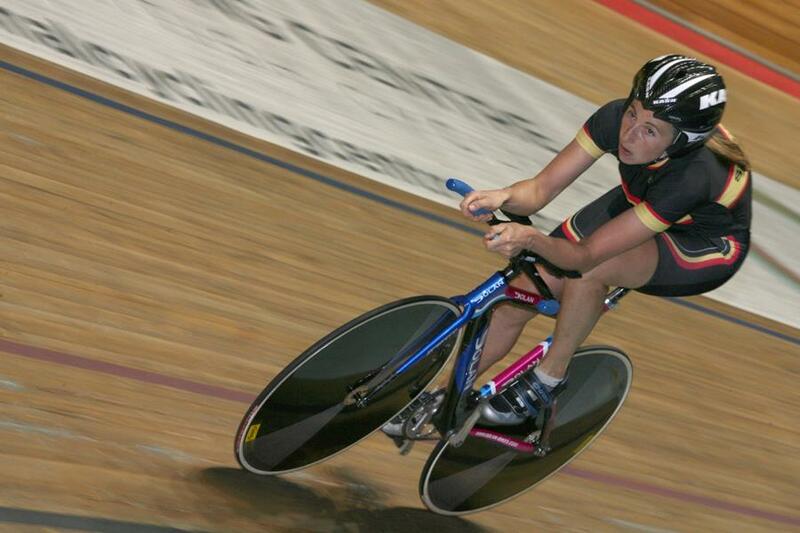 Remarkably just 4 months after giving birth to Tori, Susie won the World Masters Track Championships in Cycling in the Individual Pursuit event! What I love about this interview is the passion and energy that exudes from Susie as she writes and tells us about her athletic journey, which she enjoyed all through pregnancy and straight into the life-changing transition of motherhood. 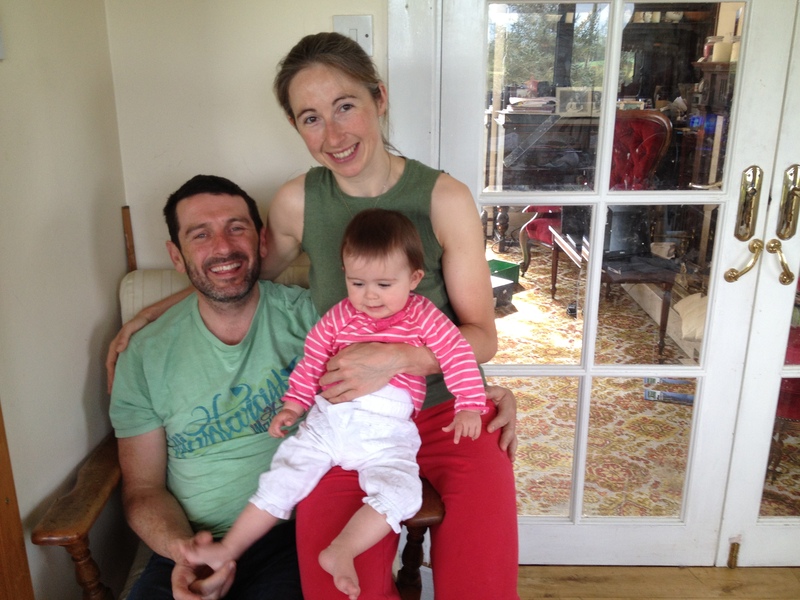 I loved hearing about how her coach creatively adapted her training through pregnancy as well. Read on and be inspired by Susie’s story! I played a bit of hockey and soccer in school and college but not seriously. I was always into running to keep fit and some mountain biking for fun, but I really only got into competitive sport in the last 6-7 years. It all started when my husband persuaded me to get involved in adventure racing. Adventure races are multisport events; they usually involve navigating around a course by mountain biking, hill running and kayaking. They can have all sorts of stuff mixed in depending on the race, such as abseiling, shooting, archery and swimming. The events I participated in usually lasted anything from 4 – 36 hours, some individual but mostly team events (mixed teams of two-four people). I used to race with my hubby and our team name was “Grounds for Divorce” – for obvious reasons! While I was on my multi-sport buzz I also did a few Xterra triathlons – I really loved them but there were very few of these organised in Ireland at the time and I think even less now. So in summary I really was a bit of a jack of all trades, relatively competent at everything but not particularly strong at anything. I did manage to podium in some of the races however, to be honest the standard in Ireland isn’t that high. Small pond and all that. 2.How did you get into cycling? How and when did you decide you would compete in Track Worlds at 4 months postpartum? As I said I started out doing a bit of mountain biking. That was about 10 years ago. We went camping in Wales for a holiday and rented mountain bikes and I loved it. In fact I bought my first mountain bike on the way home! When I got involved in the adventure racing, I started to take the mountain biking a bit more seriously and put in a bit more time in the saddle. It was the only kind of biking I had done up to that point, but in January 2011 while on holidays visiting relations in New Zealand, I got the opportunity to try riding on an indoor velodrome. It was something I had always wanted to do since watching the track racing the Beijing Olympics in 2008. It was such a buzz I was immediately hooked! I discovered when I returned to Ireland the following summer we actually had an outdoor track in Dublin and started to go to the training sessions. I seemed to be relatively good at it from the start so I shelved the adventure racing to concentrate on track cycling. 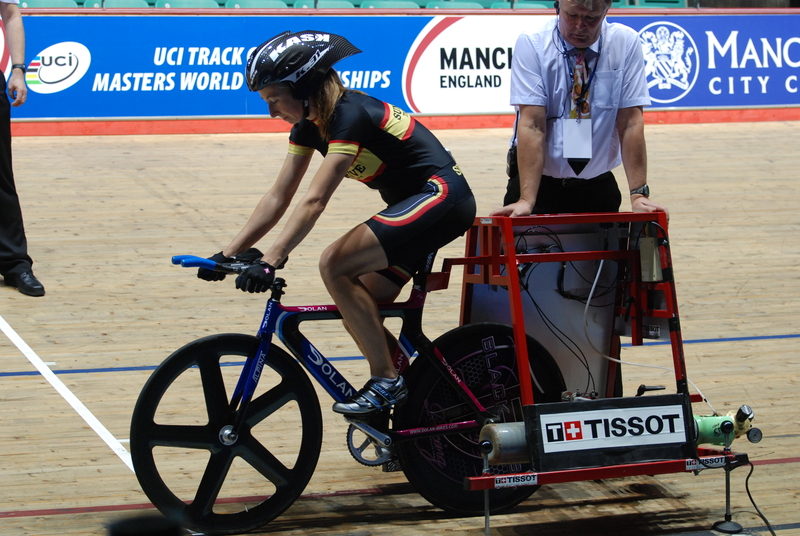 I went to the World Masters in Manchester that same autumn after just a few months of riding on the track to compete. It was my first time competing on an indoor track. I was actually about 7 weeks pregnant at the time but was in denial about it partly because I wanted to compete in the masters so much. I didn’t win any prizes but didn’t shame myself either and probably more importantly didn’t fall off the bike! It was fabulous just to be there and try competing in some of the different events. Masters sport is fantastic as it opens up the door to serious competition for everyone no matter what the age. Even though part of me was sorry I hadn’t started track racing when I was younger so I could have had a right crack at it, masters sport gives you the opportunity to compete on an international stage at any age. It was a super experience and I made up my mind there and then I was coming back with a vengeance the following year to make my mark. I wasn’t sure what I’d be able to do as I knew it would only be a few months after giving birth but the Masters became my goal for October 2013. I told everyone I was planning to go back, and most people looked at me like I was mad, knowing it would be pretty soon after having the baby. This of course just spurred me on and made me more determined. Having a goal like that really motivated me to train right throughout my pregnancy and to get back to training very soon after having my little girl Tori too. My coach (Hugh Byrne) could see I was serious about continuing to train right through pregnancy so he resigned to support me, even though he had never coached a pregnant athlete before. Firstly he helped me devise some guidelines to enable me to cycle safely right through the pregnancy. He reckoned it was also a good opportunity to focus on improving some of the technical aspects of my biking. For instance he devised some sessions for me to do on the stationary bike in the gym to improve my leg speed / cadence which is really important for the track. He also sent me to get a proper bike fit and on a course on visualisation which gave me something else to work on. All these little things kept me focused. Aside from that I was also in the gym once or twice a week cross training and doing weights and core work. I had never done any weights before and actually just started lifting when I was pregnant. When I look back now I really think all the core work and weights I did throughout stood to me and enabled me to make a speedy recovery post birth. 3. What was your training like post-childbirth? Despite all my plans for a natural childbirth I ended up having an emergency caesarean section which was a bit of a shock to say the least. I felt OK physically within a few days but I was floored mentally after having the baby – partly the shock of the responsibility and I’m sure my hormones were all over the place. Having a section hadn’t been part of my plan for getting back training but I quickly decided to focus on the positives (easy to sit back up on the bike) and was back on the track 2 ½ weeks after having the baby. The first day I got out on my bike again was a turning point for me mentally and I started to cope with being a new mom a lot better. I suppose it was the longest I had ever gone without exercise in my life which had also been taking its toll on me mentally. Getting out doing my own thing was also a bit of a relief from the intensity of minding a new-born and gave me extra energy. In training, I took it pretty easy for the first few weeks, always listening to my body and letting it be the guide of how much to push myself. Then after three weeks on the bike I felt a significant change, suddenly I felt stronger and more up for it. Trying a few sprints on the track, I could actually feel the strength coming back. I knuckled down to some more intense efforts then and about 6 weeks after giving birth won my first ever National Medal on the Track, a bronze in the Olympic Omnium. My fitness of course was still lacking but I did pretty well in the short timed events which would be my strengths (the 500 time trial, the 3km pursuit and the flying 250m) then was able to use my brain to do OK in the bunch races – the Omnium allows you the chance to play other people off against each other which worked well for me and much to my complete and utter shock left me with a bronze medal! As the summer went on, to enable me to get in training sessions during the day while I was on maternity leave, I started to take Tori to the track with me. I was really reluctant at first as I felt it wouldn’t work. But with a little encouragement from my coach I tried it out. The track was an ideal place to bring a baby, as it is a pretty secure environment and I was always able to keep an eye on her. I bought a pop-up tent to put her in if it was windy or cold or she wanted to sleep which worked really well. To my surprise I nearly always managed to get a pretty decent session in, with her either sitting in her chair watching me and my teammates whizz by or asleep in the tent! 4.How did it feel to win the masters title so soon after having Tori? Winning the individual pursuit in the masters was a real shock. 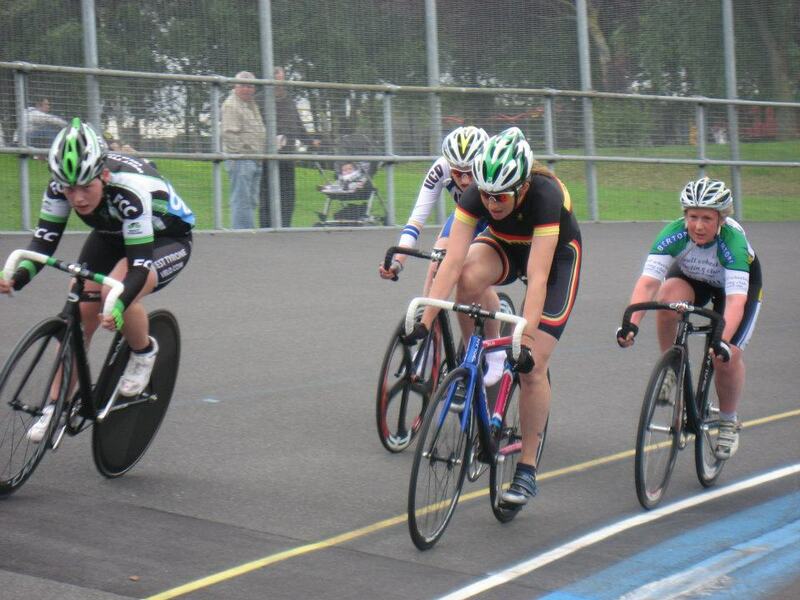 I knew I was starting to go well as had just won bronze in the nationals in the pursuit. However, based on my times during the summer, I was hoping at best to scrape into the bronze medal ride off but realistically felt I had no chance of a medal. The hardest part was trusting my coach and putting in a serious taper but it paid off, everything came together on the day and I had the performance of my life. I actually think I would never had done it had it not been for the pregnancy and becoming a mum. I don’t know if it’s the post pregnancy hormones, the fact I had limited time to train and had to train smart or if it just gave me a new way of looking at things but I rode my heart out that night to win the title, shaving a further 2 seconds off my PB that I had set that morning in the qualifying rounds. It of course was one of the best personal achievements of my life, but it was made all the sweeter because I had done it with Tori on board! 5.What are your current training/racing ambitions for 2013? I’m trying to get in as much training as I can but obviously between being back at work part time and minding a baby it’s not possible to do all you want. Such is the lot of many athlete moms out there! I’m trying to focus on quality rather than quantity and do targeted sessions where I can. I really worked hard over the winter on trying to build a better aerobic base and improve my lactate threshold, I was definitely lacking in that at this stage last year. I have just started doing some racing on the road for the first time in the last few weeks and it’s a steep learning curve. Coming from the track where it’s more about pure power, you really have to learn to mind your energy when switching to the road, not to mention use your brain a lot more. I prefer the criterium racing, it’s a bit more like the track I suppose, short, intense and less brain power required! I’m really still very much focussed on the track however and am just using the road to sharpen myself up. The track racing season is starting up again now that the weather has improved so it will be back to more specific training in the next few weeks. My ambitions for 2013 are to significantly improve my person best times particularly in the individual pursuit and the 500 time trial. I will compete in the Nationals here in September but my main focus will be the World Masters in Manchester in October so I will be building towards that. I just want to train hard and see how fast I can go, to get the best from myself, and if that’s good enough to win another rainbow jersey and retain my title all the better. The other thing that’s keeping me busy at the moment is I’m writing a book. I found that when I got pregnant I really struggled to find good advice on what I could and couldn’t do. Opinions are varied and much of the advice is over conservative. I found a way in the end and I’m writing about my experiences now. Basically I’m writing the book I would have loved to have read when I was pregnant. Of course every woman is different but it’s a story about my experience and I want to get it out there to show women what is possible. It wasn’t part of the plan but he world masters is making a nice chapter at the end! 6.How do you balance family/work/training/competing? Hmm – Without a doubt this is really the hardest question to answer. Can I pass?! I’m not sure my hubby would say I’m the best person to ask! It’s a constant challenge to try balance everything and is occasionally a bone of contention with us. My husband is into sport too and needs to get out training so sometimes it feels like were living in a revolving door, as he comes in I go out and we don’t spend as much quality time together as we used to before Tori came along. It’s important to be aware of this and try make time for doing stuff together to. I don’t know if it would be easier to have a partner who wasn’t into sport – yea it might make the scheduling of training sessions easier, but I think there is an understanding there when both love competing and we do cut each other some slack! As for competing we usually go alone as it’s just easier at the moment. Also Cormac is into adventure racing which is not a spectator sport. Hopefully when Tori gets a little bigger she will enjoy coming to the track to watch me race! Poor thing, she probably won’t have a choice! 7. Any tips or advice you would have for other moms with goals of getting back in shape or even competing again after having children? The first thing is know you can do it, it is possible. Sometimes it takes a bit more planning and time management (and an understanding spouse). You just have to be a little ruthless about it occasionally! If you’ve just had a baby, it’s good to get back into doing some training as soon as you feel able for it. The best advice I got when training either during pregnancy or post-partum was “listen to your body”. If you feel up for it you probably are. You definitely do get an aerobic boost after pregnancy for a few months and you can get your fitness back a lot quicker than you would expect by taking advantage of this time. Another thing is get help wherever you can. My mom for instance was great, mining the baby for an hour or two and letting me out for a spin. I know everyone won’t have that luxury but anyone who offers to help – don’t turn them down (as long as you know them!). It’s really important when time is limited to train smart. You don’t need to put in massive numbers of hours to get really fit. Even short sessions can be really beneficial, especially if you work at a higher intensity, and it all adds up. Don’t ever think, I won’t bother going for a spin I only have 45 minutes. Get out there, warm up and do 4 hard 5 minute intervals. They will probably benefit you more than 2 hours easy on the bike. Also consider cross training as it might be easier to fit it in. For instance go to the gym when it’s dark and do half hour on the rowing machine and a half hour of weights. I found my rollers (stationary bike trainer) absolutely essential in the first few months after having Tori. Many afternoons while she slept I would crank out a session. You have to prioritise this for it to work. 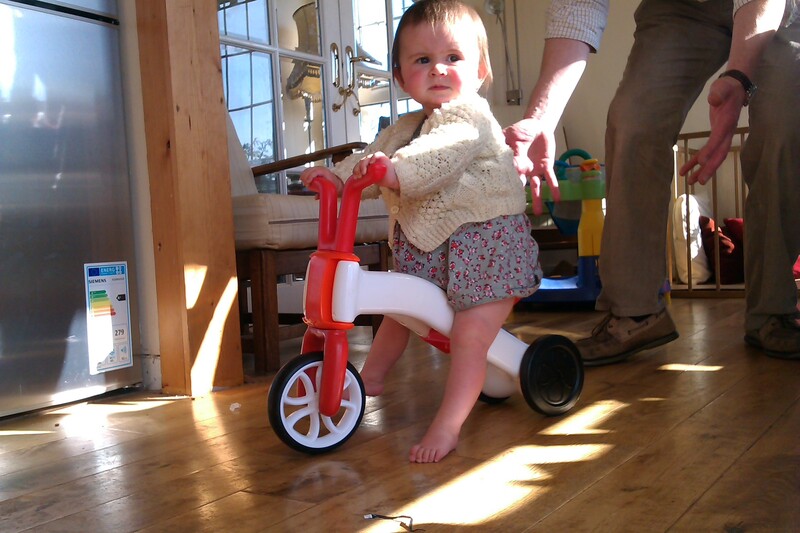 Have gear and bike at the ready, just ignore the housework and get spinning the minute the baby falls asleep! If you want to get back competing it’s essential to set some goals to focus on, be this targeting certain races or setting new PBs, it really does help your motivation to have something to work towards. I think it must work on a subconscious level. The most important thing though of course is to enjoy the training while getting there! 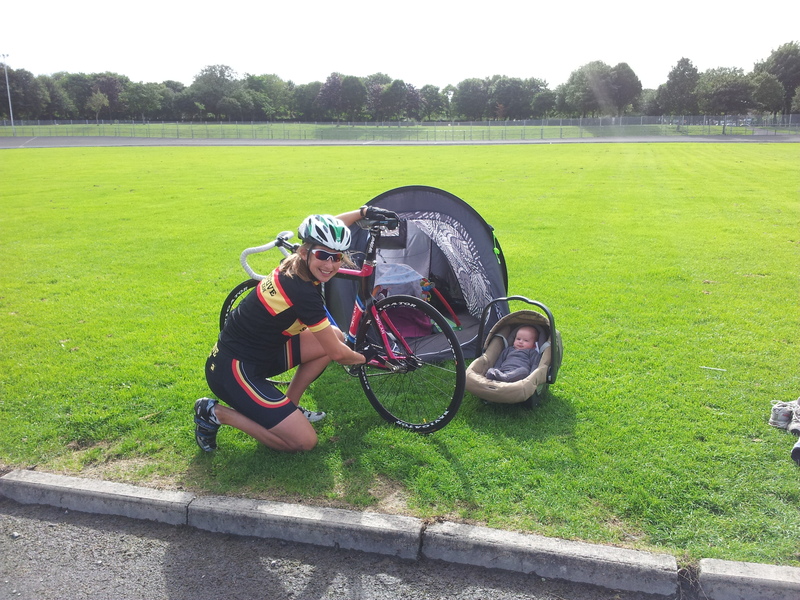 This entry was posted in Athlete-Mom Interviews and tagged athlete-mom interview, cycling by Danelle Kabush. Bookmark the permalink.